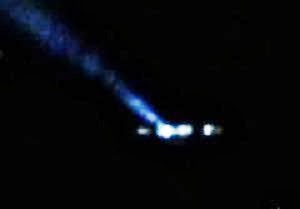 A putative UFO was recorded on video on 11 February 2014. The videographer adds that it was recorded at 22:00 hours on that day, adding: "I'm not saying it's a spaceship, but it is an unidentified flying object." The video - 1:30 minutes long - shows a light in the sky whose trajectory eliminates the likelihood of it being an airplane, as it comes and goes. The sighting took place at the Los Almedros II Park in Ciudad Caucel. The videographer's attention was drawn by the shining object and he decided to record it on his tablet. Argentina: A UFO Over Lake Musters? Ultraterrestrials or Pilots of the Spaceways? Mexico: UFOs or Drones Over Reynosa?